While Newark has never been a one-industry town, leather has been manufactured here almost from the city's beginning. Indeed, it has been part of Newark's industrial cornucopia and continues to this day as an important locally manufactured product. Newark's Puritan settlers brought with them a host of basic skills, including the ability to tan a hide of an occasionally slaughtered cow or occasionally traded pelt. In 1680, the Township of Newark invited Samuel Whitehead of Elizabeth to settle here and to bring with him his trade of shoemaker. Eighteen years later, Newark's first tannery was built at the town's Watering Place. But it was in 1780 that the true origins of the modern industry can be found with the arrival of Moses Combs. Before Combs' arrival, most shoemaking was done in a home or cottage-type industry. It was Combs, often referred to as the father of modern industry, who made the factory the focal point of shoe manufacturing. Moses Combs' first successful business venture was with Colonel John Rutherfurd of South Carolina, who purchased 200 pairs of sealskin shoes. From that time on, orders for Newark-made shoes and leather goods increased at a tremendous pace. Seth Boyden was another important contributor to the local leather industry. He came to town in 1815, bringing with him a leather splitting device. By 1818 he began producing patent leather, which he perfected. In 1822, Boyden's profits were $4,521. By 1827, they had risen to $20,341. Throughout the 19th century, there was continued evidence of both the strength and progress of the industry. In 1806, Charles Brasham, headmaster of Newark Academy, drew the famous Shoemaker Maps of Newark, which depicted the original town lots, important commercial and governmental sites in the township, and the famous cartouche with a statement indicating that the shoemaking industry employed about one-third of Newark's working population. During the War of 1812, Newark's leather output was further increased by orders for shoes and leather-related goods. In 1818, Seth Boyden was producing patent leather. By 1826, Newark's first industrial census reflected a leather-based economy unmatched anywhere in the United States. Isaac Nicholls, the town assessor, reported that Newark's population had climbed to slightly over 8,000 people, including 685 employed as shoemakers, 61 as curriers, 57 as saddle makers, 17 as tanners, 7 as trunk makers, and 3 as Morocco leather dressers. By 1832, nearly 2 million shoes were being produced annually. During the great national panic of 1837, Newark's expanding industrial economy was damaged in general, and the leather producers suffered in particular. It was during this time that many local shoemakers moved to New England. However, as the Civil War approached, business returned with renewed Southern orders before 1861, and a spate of Union contracts as war ensued. By 1860, 90 percent of all American patent leather was made in Newark. In fact, 30 Newark tanneries employed 1,064 men with an annual production of over $3 million. The 1870 Industrial Census reported that figure had risen to $8.6 million. By 1910, it had reached $21 million. Newark not only was producing fine general leather goods for America, but was specializing in fancy and ornamental hides, including kangaroo, kid, buckskin, alligator, seal, horsehide, reptile, porpoise, walrus and calf. Unusual tanning had become a Newark specialty, and Newark boasted it could handle any hide. Near the close of the century in 1893, Martin Dennis added to Newark's leather technology by developing the one-bath system of chrome tanning. The arrival of the 20th century witnessed a change in industrial patterns in Newark, New Jersey and the United States. By 1955, historian John Cunningham said 'New Jersey no longer holds the position of national leather leadership of a century ago, yet it is equally clear that the industry is important, both to the state and to the nation.' By 1969, 43 leather producers remained in Newark, but contemporary newspaper articles were urging that the state's 15 congressional delegates and the President impose trade restrictions on cheap imports from Formosa, Spain, Portugal, France and Hong Kong. Bernard Nortman, city economist and head of the Newark Economic Development Office at that time, pleaded for similar protection for the city's foods processing, rubber and plastics industries. A check of today's telephone book shows a listing of eight leather companies. The New Jersey Industrial Directory lists 18. While its prominent role as Newark's leading manufacturing industry has been greatly reduced, leather still is remembered as Newark's first great industry and continues to contribute to the city's industrial life. 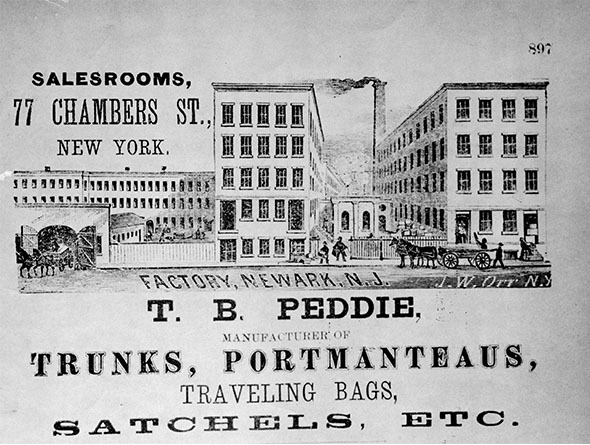 Newark-made leather products as well as paint, varnish, cutlery, jewelry, cotton thread, machines of all types, and nearly a thousand types of products proudly carried the city's name around the nation and throughout the world. The slogan 'Made in Newark, N.J.' was indeed a proud and envied one.